Just like magic, a ghost orchid (Dendrophylax lindenii) appears overhead in a Florida swamp. Its pale roots extend like gloved fingers across the bark of a pond apple tree (Annona glabra), while its graceful flower reflects onto the shadowed water below. Doctoral student Lynnaun Johnson wades over for a closer look. 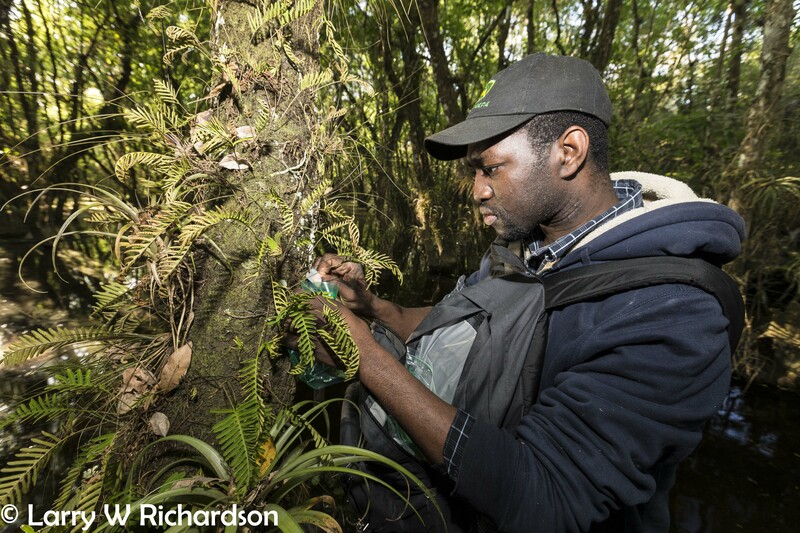 Habitat is shrinking for this reclusive orchid, and he is using a unique approach to better understand the species’ uncommon lifestyle. 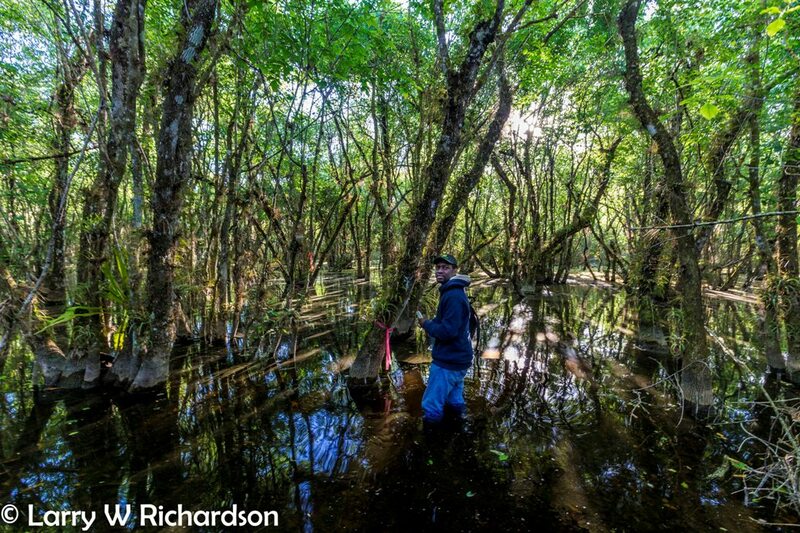 During March 2016 fieldwork in the Florida Panther National Wildlife Refuge, Johnson went deeper every day—even when it meant paddling his canoe within 10 feet of a sunstruck alligator to reach the widely dispersed plants. Each time he located an orchid, he looked past the plant and took a sample from the bark of its host tree. Species within the orchid family are generally known to depend on fungi to help them through key stages of life, such as growing from a seed into a seedling. But there are differences in how those partnerships work. When an orchid lives in soil, the fungi help move water and nutrients to and from the roots. But when the orchid lives on a tree, scientists are less certain of what occurs. Lynnaun Johnson wades toward a ghost orchid. 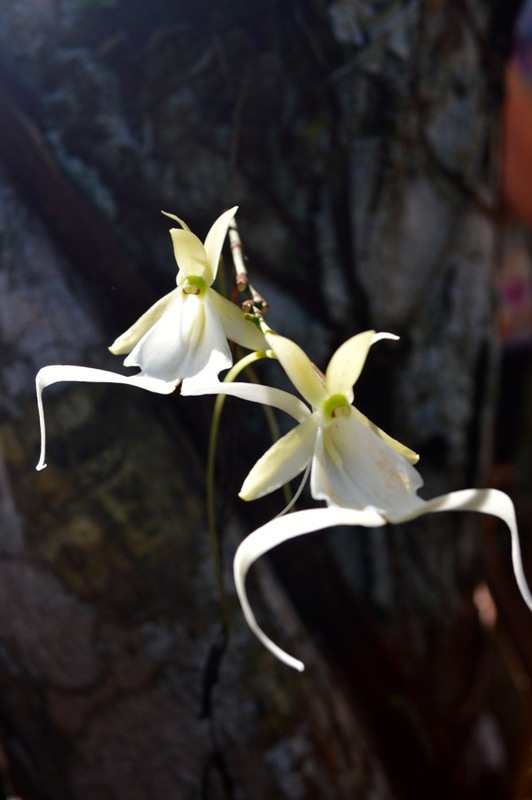 Until recently, they believed that orchids growing on trees were less likely to depend on fungi long term. This belief was encouraged by the discovery that the prominent roots of plants like the ghost orchid actually conduct photosynthesis—a process in which sunlight becomes sugar. That process is managed by leaves in many other orchid species. If the roots are so full of nutrients, do they really need any help from fungi? A ghost orchid grows in the wild. Photo © Rebecca Weil. They sure do, said Johnson and his collaborators, who examined the roots of another tree-bound orchid species, the vanilla orchid (Vanilla planifolia). Using modern technology called high-throughput sequencing that can produce more detailed results than ever before, they found that epiphytic orchids—those that grow on trees—also rely on fungi to carry out essential functions. “We know the importance of photosynthesis, but that doesn’t mean if a plant is photosynthesizing it’s healthy. It means it will continue to rely on fungi to grow and develop,” said Johnson. He recently documented the presence of fungi in the roots of ghost orchid root samples from his field work. 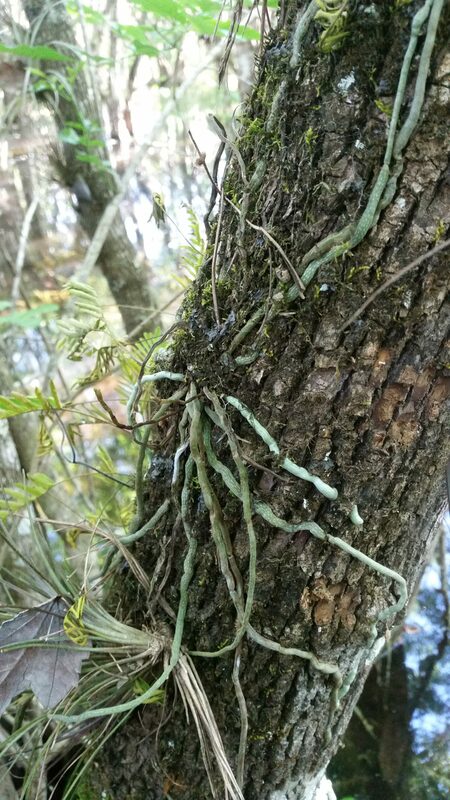 Back in the field, Johnson wondered if the type of fungi present on certain tree species is what led the ghost orchids to select them as their home over other trees. In the Florida refuge, the orchids are found only on pond apple and pop ash trees (Fraxinus caroliniana). So during his fieldwork, he sampled both types of trees, some with and some without orchids. As a point of comparison, he also sampled the bark of bald cypress trees (Taxodium distichum). He plans to conduct more fieldwork this spring before examining the bark for fungi. The number of ghost orchids in Florida has dwindled as more and more swamps have been drained to build new housing complexes to accommodate a growing population. There have also been times when the trees in the swamps were logged. Johnson will later examine the roots of other orchid species that neighbor the ghost orchids on trees. This will further clarify the importance of fungi to the ghost orchid, which he suspects relies on the fungi more than neighboring orchid species. He also has his eye on a population of orchids growing naturally in Cuba on a larger number of trees that he hopes to study as well. Johnson aims to help people understand that there is more than a one-to-one relationship in nature, and that multiple partnerships contribute to the health of each species and system. For example, “if we understand the significance of host trees, then we can preserve both the host trees and epiphytic orchids at the same time,” he said. Orchids may become a lifelong pursuit for Johnson, who moved to Illinois from his childhood home on the island of St. Lucia to pursue his studies. He hopes to specialize in the study of fungi as it relates to plants and the conservation of wild lands and waters. Read more about orchid research at the Garden, and be sure to visit the Orchid Show, open February 11 through March 26, 2016. The research is almost as interesting as the elusive orchid! Thanks for posting.